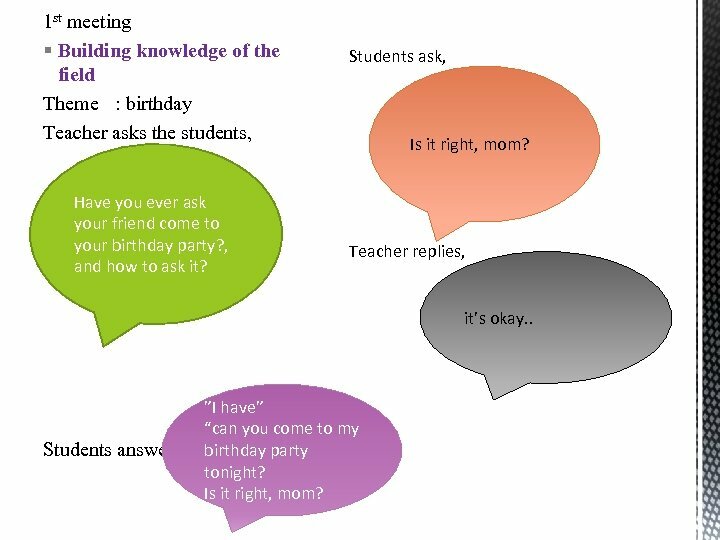 1 st meeting § Building knowledge of the field Theme : birthday Teacher asks the students, Have you ever ask your friend come to your birthday party? , and how to ask it? Students ask, Is it right, mom? Teacher replies, it’s okay. . Students answer, ”I have” “can you come to my birthday party tonight? Is it right, mom? 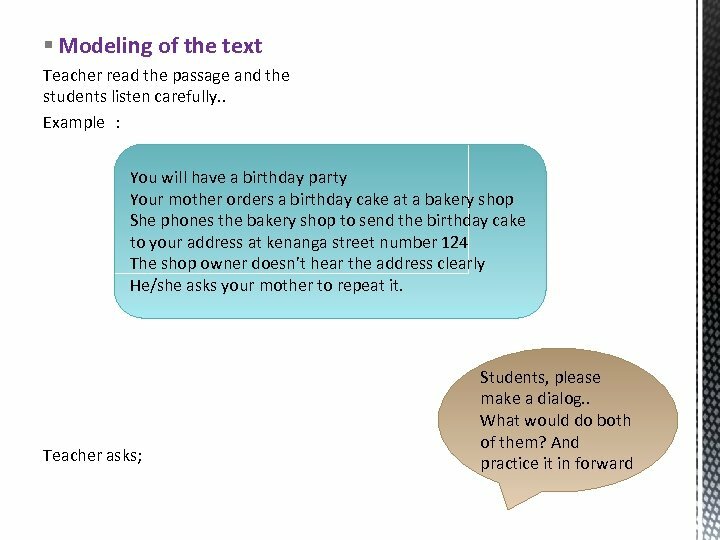 Group 1 answer: § Joint construction of the text. . Look at the picture : Teacher choose group 1 and group 2 come to forward. 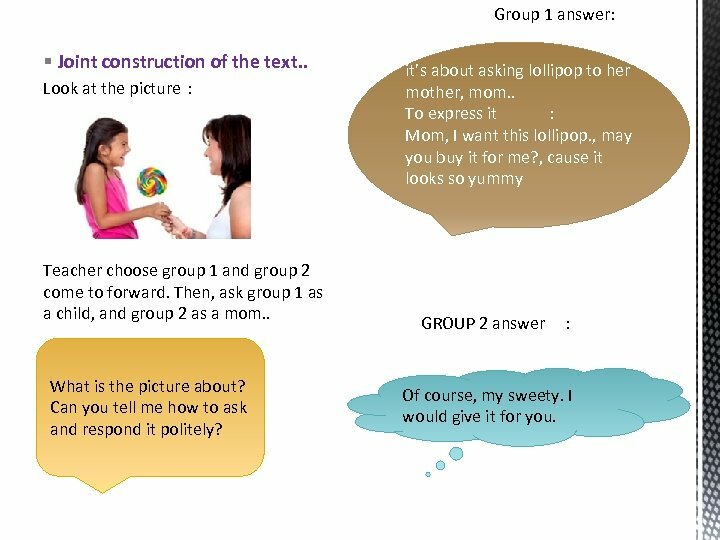 Then, ask group 1 as a child, and group 2 as a mom. . What is the picture about? Can you tell me how to ask and respond it politely? it’s about asking lollipop to her mother, mom. . To express it : Mom, I want this lollipop. , may you buy it for me? , cause it looks so yummy GROUP 2 answer : Of course, my sweety. I would give it for you. § INDEPENDENT CONTRUCTION OF TEXT : Teacher asks about this picture and choose one student. 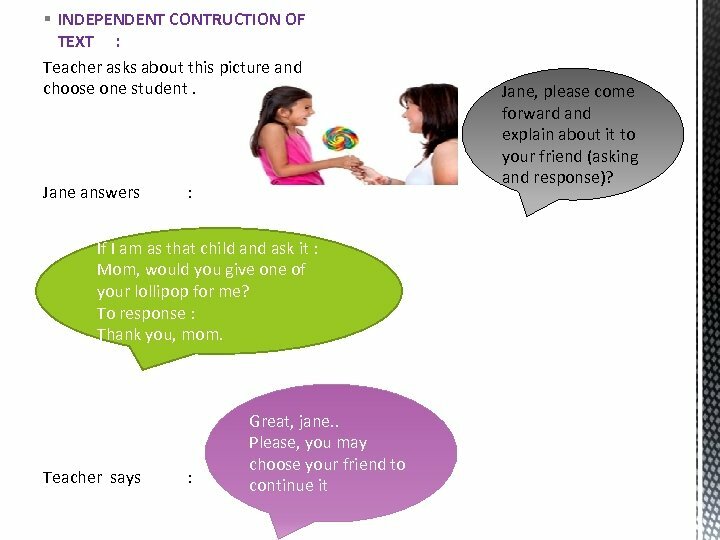 Jane answers : If I am as that child and ask it : Mom, would you give one of your lollipop for me? To response : Thank you, mom. Teacher says : Great, jane. . Please, you may choose your friend to continue it Jane, please come forward and explain about it to your friend (asking and response)? 1. 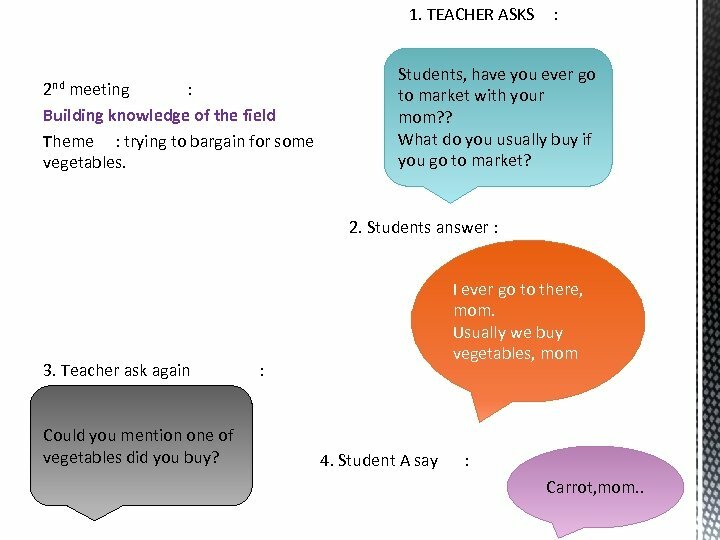 TEACHER ASKS 2 nd meeting : Building knowledge of the field Theme : trying to bargain for some vegetables. : Students, have you ever go to market with your mom? ? What do you usually buy if you go to market? 2. Students answer : 3. Teacher ask again Could you mention one of vegetables did you buy? I ever go to there, mom. Usually we buy vegetables, mom : 4. 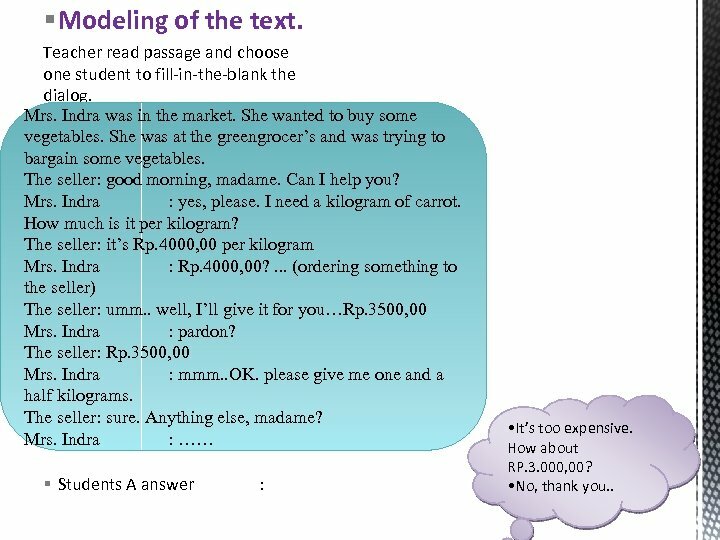 Student A say : Carrot, mom. .
§ Modeling of the text. Teacher read passage and choose one student to fill-in-the-blank the dialog. Mrs. Indra was in the market. She wanted to buy some vegetables. She was at the greengrocer’s and was trying to bargain some vegetables. The seller: good morning, madame. Can I help you? Mrs. Indra : yes, please. I need a kilogram of carrot. How much is it per kilogram? The seller: it’s Rp. 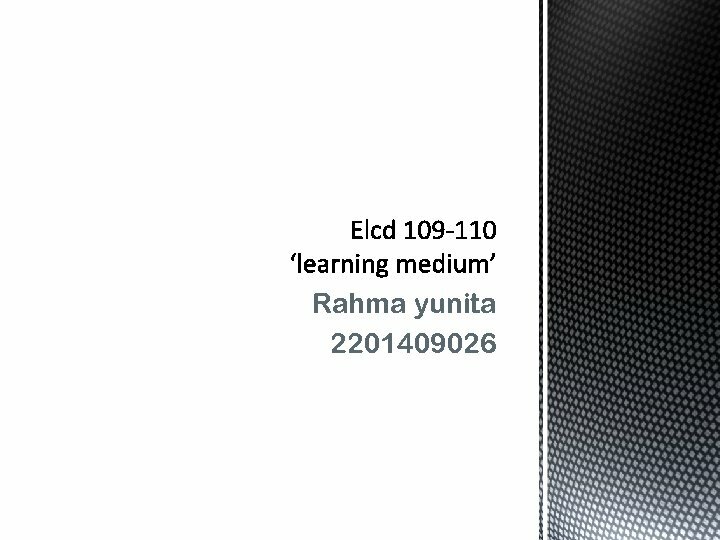 4000, 00 per kilogram Mrs. Indra : Rp. 4000, 00? . . . (ordering something to the seller) The seller: umm. . well, I’ll give it for you…Rp. 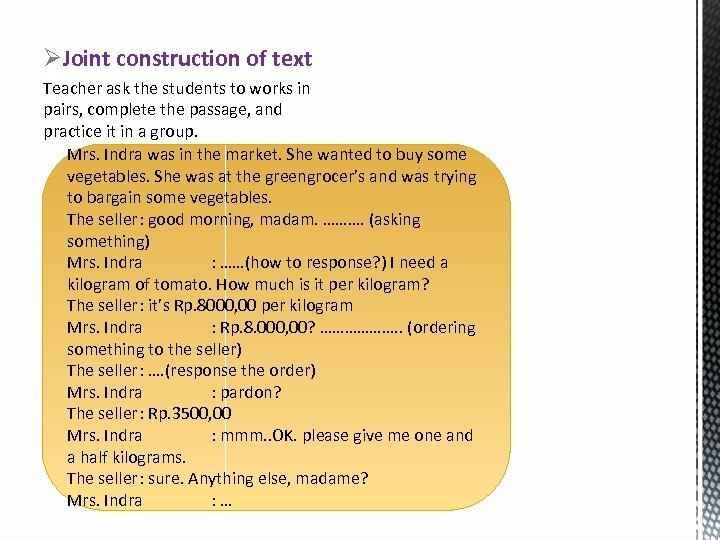 3500, 00 Mrs. Indra : pardon? The seller: Rp. 3500, 00 Mrs. Indra : mmm. . OK. please give me one and a half kilograms. The seller: sure. Anything else, madame? Mrs. Indra : …… § Students A answer : • It’s too expensive. How about RP. 3. 000, 00? • No, thank you. .
§ Independent construction of text Teacher choose one student to practice in front of class. Teacher ask firstly : Student answer : Teacher says : When you will buy tomato, and then you find a putrid tomato. you must change it. 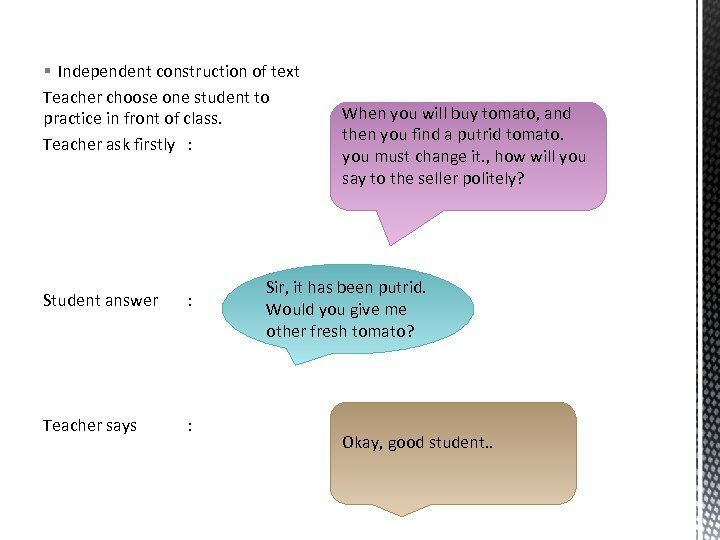 , how will you say to the seller politely? Sir, it has been putrid. Would you give me other fresh tomato? Okay, good student. . 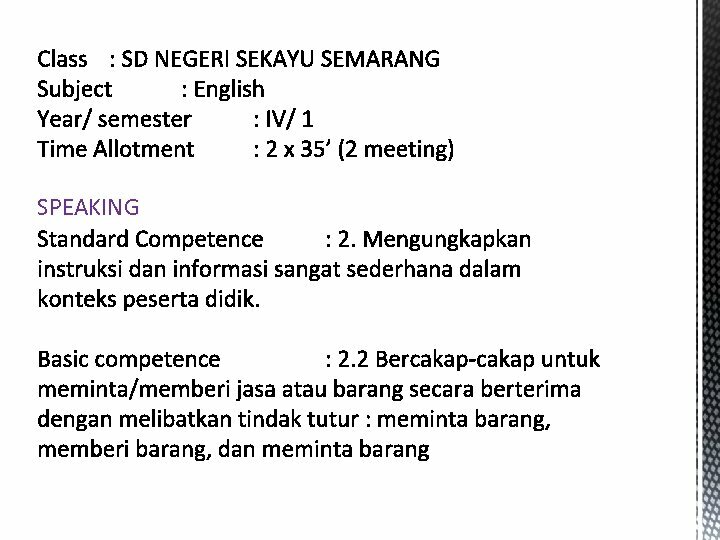 Language Skills Speaking Speaking. Interaction.